— The Philadelphia Inquirer: "The future of Philadelphia music"
Learn more below or link to the Gallery. SoundLAB, a contemporary music ensemble led by Music Director Robert Whalen and Artistic Director Katherine Skovira, performs curated programs advocating for living composers and in the service of contemporary music. SoundLAB will debut with the Philadelphia Orchestra’s Barnes-Stokowski Festival this October 15-18, 2018, with five days of events and concerts that celebrate the musical influences of Dr. Barnes and Maestro Stokowski. These curated programs will extend the musical influences of Barnes and Stokowski into the present day with notable U.S. and Philadelphia premieres of works by living composers. 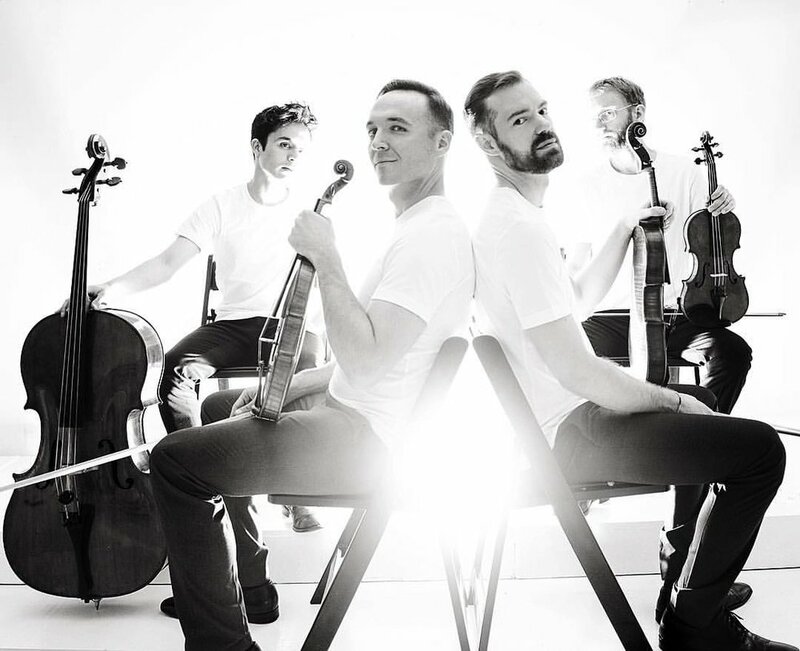 SoundLAB’s two concerts (October 16 and 18) feature the JACK Quartet as guest artists and Augusta Read Thomas as Composer-in-Residence alongside contemporary musicians from around the world. These concerts are FREE and open to the public, but online RSVPs at www.philorch.org/barnesstokifestival are encouraged. "This is music that is always in motion, as if coming perpetually out of a magician’s hat. It leads but doesn’t direct, and is playful and subtle, dancing on light feet. It is music that conjures." The New York Times article of March 6, 2015 states that Thomas had the distinction of having her work performed more frequently in 2013-2014 than any other living ASCAP composer, according to statistics from performing rights organization. Former Chairperson of the American Music Center, she serves on many boards, is a generous citizen in the profession at large, and, according to the American Academy of Arts and Letters, “has become one of the most recognizable and widely loved figures in American music.” In 2017, she was named Chicagoian of the Year. A Grammy winner, her impressive body of works embodies unbridled passion and fierce poetry. The New Yorker called her "a true virtuoso composer." Championed by such luminaries as Barenboim, Rostropovich, Boulez, Eschenbach, Salonen, Maazel, Ozawa, and Knussen, she rose early to the top of her profession. As an influential teacher at Eastman, Northwestern, Tanglewood, Aspen Music Festival, now she is the 16th ever University Professor (one of only 7 current University Professors) at the University of Chicago. She has said, “Teaching is a natural extension of my creative process and of my enthusiasm for the music of others.” In 2015, she founded the Center for Contemporary Composition at the University of Chicago. Thomas was the longest-serving Mead Composer-in-Residence for Daniel Barenboim and Pierre Boulez with the Chicago Symphony from 1997 through 2006, a residency that culminated in the premiere of Astral Canticle – one of two finalists for the 2007 Pulitzer Prize in Music. During her residency, Thomas not only premiered nine commissioned orchestral works, but also was central toward establishing the thriving MusicNOW series on which she commissioned and programmed the work of many living composers. Thomas envisioned, spearheaded and led the EAR TAXI FESTIVAL, a 6-day-long new music festival in October 2016 celebrating the current vibrant and booming classical contemporary music scene in Chicago. 350 Chicago-based musicians, 53 world premieres, performances of 35 already existing works, 25 ensembles, 88 Chicago-based composers, and 5 installations by Chicago-based composers. Recent and upcoming commissions include those from Santa Fe Opera (and a consortium of 8 other opera companies,) the Boston Symphony, the Utah Symphony, Wigmore Hall, JACK Quartet, Third Coast Percussion, Tanglewood, the Danish Chamber Players, Notre Dame University, and the Fromm Foundation. She won the Ernst von Siemens Music Prize among many other awards. She is a member of the American Academy of Arts and Sciences and of the American Academy of Arts and Letters. G. Schirmer, Inc. is the exclusive publisher of her music worldwide for all works composed from 1988 until December 31, 2015. Nimbus Music Publishing is the exclusive publisher of her music worldwide for all works composed after January 1, 2016. Her discography includes 82 commercially recorded CDs. Ms. Thomas studied composition with Oliver Knussen at Tanglewood (1986, 1987, 1989), Jacob Druckman at Yale University (1988), with Alan Stout and Bill Karlins at Northwestern University (1983-1987), and at the Royal Academy of Music in London (1989). She was a Junior Fellow in the Society of Fellows at Harvard University (1991-94) and a Bunting Fellow at Radcliffe College (1990-91). She took piano and trumpet lessons for 14 years; sang in choirs for 10 years; played and sang folk/pop/blues songs on guitar for much of her childhood; played in Jazz bands in high-school and in college; and listens passionately to an extremely wide diversity of music(s). BIOGRAPHY BY G. SCHIRMER, INC. The recipient of Lincoln Center’s Martin E. Segal Award, New Music USA’s Trailblazer Award, and the CMA/ASCAP Award for Adventurous Programming, JACK has performed to critical acclaim at Carnegie Hall (USA), Lincoln Center (USA), Miller Theatre (USA), Wigmore Hall (United Kingdom), Muziekgebouw aan ‘IJ (Netherlands), IRCAM (France), Kölner Philharmonie (Germany), the Lucerne Festival (Switzerland), La Biennale di Venezia (Italy), Suntory Hall (Japan), Bali Arts Festival (Indonesia), Festival Internacional Cervatino (Mexico), and Teatro Colón (Argentina). JACK operates as a nonprofit organization dedicated to the performance, commissioning, and spread of new string quartet music. Dedicated to education, the quartet has held residencies at Columbia University, Harvard University, New York University, Princeton University, Stanford University, and the University of Washington. Conductor and composer Robert Whalen has conducted dozens of world premieres and numerous contemporary masterworks. Whalen was personally selected by Lorin Maazel as Conducting Fellow for the 2014 Castleton Festival and has served as Music Director of The Barnes Ensemble and the Chamber Orchestra at the University of Chicago. He is a protégé of Pulitzer Prize-winning composer Steven Stucky at Cornell University. A native of New York, Whalen serves as Music Director of the contemporary ensemble SoundLAB, which will perform as part of the Barnes/Stokowski Festival presented by the Philadelphia Orchestra. A champion of new works, Katherine Skovira’s solo performance highlights include Berio’s Coro with Sir Simon Rattle, Augusta Read Thomas’s Final Soliloquy of the Interior Paramour with Alarm Will Sound, and Grisey’s Quatre chants pour franchire le seuil with Robert Whalen. Skovira has sung in Lucerne, Oslo, Los Angeles, Aspen and Castleton, and receives close mentorship from Barbara Hannigan and Lucy Shelton. A native Philadelphian, Skovira serves as Artistic Director of SoundLAB and has been responsible for the curation of performances across major Philadelphia institutions. Emma Resmini (NY) – Emma Resmini is a passionate advocate of contemporary music, and has premiered over twenty works. Emma has soloed numerous times with the National Symphony, as well as the Philadelphia Orchestra, Dallas Symphony, Pittsburgh Symphony, and Shenandoah Valley Bach Festival Orchestra. A review of her performance at the 2016 New Music Gathering by the contemporary classical music website I Care If You Listen raved “Emma Resmini stunned the crowd”, and her performance of Stockhausen’s cycle KLANG was praised for its “buoyant cognitive comprehension.” (David Patrick Stearns, Condemned to Music) Emma is currently pursuing her Master of Music degree at The Juilliard School, and is a proud recipient of a Kovner Fellowship. She received her Bachelor of Music degree from the Curtis Institute of Music. Andrew Nogal (Chicago) – Oboist Andrew Nogal, longtime member of Ensemble Dal Niente, has performed with the Chicago Symphony Orchestra, Oregon Symphony, CSO MusicNOW, Talea Ensemble, and Alarm Will Sound. His festival appearances include Cabrillo, Ojai, Astoria, Peninsula, Great Lakes Chamber Music, June in Buffalo, Ravinia, and the NY Phil Biennial. He is a member of the Grossman Ensemble at the Chicago Center for Contemporary Composition. Recent international engagements include Japan, Australia, New Zealand, and the Beijing Modern Music Festival. An alumnus of the Lucerne Festival Academy, Nogal won first prize at the Fischoff Competition and the Kranichstein Music Prize at the Darmstadt Summer Courses. Eric Umble (NY) –is a versatile, award winning clarinetist hailed as "lovely" (New York Arts) and known for his "... nuanced and coloristic playing." (The Clarinet). Eric enjoys a diverse international career as a soloist, chamber musician, orchestral player, and music educator. An advocate for and avid performer of contemporary music, he is founding member ofSoundMind,sTem,andDuoHelixensembles; all champion music by living composers. Eric received his Bachelors and Masters degrees from the Manhattan School of Music studying with David Krakauer and Anthony McGill. For more information, visit www.ericumble.com. Ben Roidl-Ward (Chicago) –is a bassoonist and improviser based in Chicago who is dedicated to working with and advocating for composers of his generation. He has appeared as a soloist with the Seattle Symphony and the Oberlin Contemporary Music Ensemble, and has performed with the International Contemporary Ensemble, Ensemble Dal Niente, the Chicago Symphony, and the New York Philharmonic. A 2018 Luminarts Fellow in Classical Music, Ben is a member of the Civic Orchestra of Chicago and a student of David McGill at Northwestern University. He also studied with Ben Kamins, George Sakakeeny, and Francine Peterson. Sheryl Hadeka (Buffalo, NY) – Ms. Sheryl Hadeka is second horn in the Buffalo Philharmonic Orchestra. She has previously held positions in Omaha, New Mexico, Tucson, and Louisiana and has also performed as an extra musician in Dallas, San Antonio, Rochester, and Atlanta. Ms. Hadeka has spent summers performing at Music in the Mountains, Spoleto Festival, and the Lucerne Festival Academy. She recently worked with the Lucerne Festival Academy Alumni Ensemble on projects in both Switzerland and New York City. Ms. Hadeka earned her bachelor’s degree from the Eastman School of Music and her master’s degree at Southern Methodist University. Gareth Flowers (NY) - is originally from Arlington, Virginia. He studied at the Cleveland Institute of Music, and has a BM and MM from the Juilliard School. While at Juilliard, he also studied music technology, performed at the Beyond the Machine festival, and started writing and recording electro-acoustic music. Gareth has been a member of the International Contemporary Ensemble (ICE) since 2007. He has performed with TILT Brass, Wet Ink, Either/Or, the Argento New Music Project, Ymusic, Gotham Chamber Opera, the Portland Chamber Music Festival, Camerata Pacifica, and the Copland House Ensemble. Gareth has performed as guest principal trumpet of the San Francisco Symphony, the National Symphony, the Seoul Philharmonic, and the Saint Paul Chamber Orchestra. He held a one year position with the Metropolitan Opera Orchestra, and has played in the New York Philharmonic, Philadelphia Orchestra, and Baltimore Symphony. Gareth has recorded for John Adams, Philip Glass, David Byrne & St. Vincent, Anthony Braxton’s Tri-Centric Orchestra, Matthias Pintscher, Anthony Coleman, DuYun, Gabriel Kahane, Sasha Gordon, Andy Bloch, and Nick Britell. His two solo recordings so far are titled Acousmatic, and A Beginner’s Guide to Lucid Dreaming. Gareth contributed both music and voice-over to the first two versions of Waywords and Meansigns, an audiobook project of James Joyce’s Finnegan’s Wake. Weston Olencki (NY) - Weston Olencki is a trombonist/composer working at the boundaries of sound art, composition, improvisation, and electronic noise, testing the emerging artistic and social relationships between humans and machines through intense, sustained collaborations. He has presented work at the Borealis Festival [Bergen], ISSUE Project Room [NYC], Transparent Sound [Budapest], Time of Music [Viitasaari], REDCAT [LA], Blanton Museum of Art [Austin, TX], Squeaky Wheel [Buffalo], Mostly Mozart Festival [NYC], Weisslich [Manchester/London], Qubit [NYC], Constellation's Frequency Series [Chicago], Indexical [Santa Cruz], and OPTION [Chicago], and was awarded the Kranichsteiner Musikpreis for performance from the 2016 Darmstadt Ferienkurse. He also co-curates/presents the Chance and Circumstance festival, an annual festival for experimental arts in NYC. Weston has held residencies at the University of California Santa Cruz, Harvard, NYU, Columbia, Stanford, Northwestern, and was a 2018 visiting artist at CalArts. He has recorded for HatHut, Not Two, Sound American, Carrier Records, Parlour Tapes+, Clean Feed, Anticausal Systems, Dinzu Artefacts, with forthcoming solo releases on Carrier and Astral Spirits. He is an active member of RAGE THORMBONES, Ensemble Pamplemousse, the Wet Ink Large Ensemble, tunnels, and performs regularly as a soloist and ensemble member on low brass, modular synthesizers, and electronics. He lives in New York City. Edo Frenkel (Rochester, NY) - is a conductor, composer, and pianist whose work spans the repertoire of the standard western cannon, opera, and experimental music. Mr. Frenkel has guest conducted, Ensemble Meitar, Ensemble Mise-en, and was the assistant conductor to Simon Rattle in Stockhausen’s Gruppen with the London Symphony Orchestra at the Lucerne Festival. Mr. Frenkel served as Barbara Hannigan’s rehearsal pianist, collaborating on the Satie: Socrate project at the Ruhrtriennale Festival in Bochum, Germany and at the Park Ave. Armory in New York city. He has also performed alongside jazz legends Peter Erskine and Randy Brecker. He served as the assistant music director of Eastman Opera Theatre from 2015-2017 and has worked as the assistant conductor to Brad Lubman and the Eastman Musica Nova ensemble since 2014. Mr. Frenkel has appeared in performances with such notable groups as Tonkünstler Orchester-Neider Östereich, Ensemble Intercontemporain, JACK quartet, members of New World Symphony, Ulysses Ensemble, and the String Orchestra of Brooklyn. Mr. Frenkel’s music has been performed in international festivals by artists such as Talea Ensemble, EXAUDI vocal ensemble, JACK quartet, Tonküntsler-Orchester Niederösterreich, and Ensemble Paramirabo. His music has been performed in the US, Canada, Japan, and various countries in Europe. He has been featured in such festival’s as Royaumont Voix Nouvelles (France), CEME (Israel), and the ME_MMIX festival (Spain). Upcoming engagements include guest conducting appearances with the Ludwig Orchestra at the Ojai Festival. He will play in the orchestra for a European tour of Stravinsky’s Rake’s Progress with Equilibrium Young Artists. Won Suk Lee (S. Korea/Chicago) – A 2018 Graduate of the Curtis Institute of Music, Won Suk Lee’s career highlight includes, making Amercian concerto debut with the Philadelphia Orchestra, working with some of the most important living composers such as Helmut Lachenmann, Unsuk Chin, Matthias Pintscher, Oliver Knussen, and playing in prestigious festivals such as Spoleto USA, Aldeburgh, Verbier festivals with great interpreters including Yannick Nézet-Séguin, Zubin Mehta, Esa-Pekka Salonen, Valery Gergiev, and Semyon Bychkov. Marina Kiefferstein (NY) - Marina is a violinist and composer based in NYC. Equally comfortable in major international venues and DIY spaces, she enjoys a diverse career that encompasses chamber music, orchestra, and solo performances. She is a founding member of TAK ensemble and The Rhythm Method string quartet, and is a regular guest with the International Contemporary Ensemble, Wet Ink, and Talea. Marina is currently a DMA candidate at the CUNY Graduate Center under the tutelage of Mark Steinberg. She holds an MM in Contemporary Performance from the Manhattan School of Music, a BM in Violin from Oberlin Conservatory, and a BA in English from Oberlin College. She is on violin faculty at the United Nations International School and the Composers Conference. Giancarlo Latta (Houston) - Fiercely committed to the music of our time, violinist Giancarlo Latta has premiered dozens of works by composers both young and established. Recent highlights include duo performances with flutist Claire Chase as part of Houston’s Da Camera series, a George Lewis world premiere at the Banff Centre, the U.S. premiere of Liza Lim’s opera Tree of Codes at the Spoleto Festival, and residencies at the Avaloch Farm Music Institute and the Barnes Foundation in Philadelphia. 2018-19 sees the beginning of a multi-year project, “24/21 [24 Caprices for the Twenty-First Century],” a commissioning mechanism for a new body of violin repertoire exploring the ever-broadening meaning of virtuosity. Latta has performed with the International Contemporary Ensemble and members of the JACK Quartet, and has been heard in venues as diverse as the Rothko Chapel in Houston, National Sawdust in Brooklyn, and London’s Royal Albert Hall as part of the BBC Proms. He is entering his second year of graduate studies at Rice University, where he studies violin with Paul Kantor and composition with Anthony Brandt. Josh Wareham (MN) - Boston-based violist Josh Wareham is a versatile performer committed to engaging audiences and empowering communities through a broad range of music from both the past and present. Josh has performed at the Lucerne, Aspen, Bang on a Can, Domaine Forget, and Madeline Island festivals; as well as at the Banff Centre, on “The Conservatory Project” series at the Kennedy Center, as a soloist with the St. Olaf Orchestra, and in concerts with the JACK Quartet, Palaver Strings, Shelter Music Boston, Boston Philharmonic Orchestra, Atlantic Symphony Orchestra, Albany Symphony, and Cayuga Chamber Orchestra. Josh holds a Master of Music degree from from the Eastman School of Music, and a Bachelor of Music degree from St. Olaf College. Issei Herr (NY) - An advocate for the music of our time, Issei has worked closely with composers such as Mario Davidovsky and Kaija Saariaho, and has premiered works by Eric Nathan, Roberto Sierra, and Kenji Sakai, among others. In 2016, he performed the New York premiere of Dmitri Yanov-Yanovsky’s Hearing Solutionwith Joel Sachs and the New Juilliard Ensemble. Born into an artistic family, Issei began musical studies at the age of five. He is currently pursuing studies at The Juilliard School, where he is a student of cellist Fred Sherry. Emilio Guarino (NY) - Emilio Guarino is a performer and producer with experience that ranges from orchestral performance to contemporary electronic music, modern improvisation, and multi-disciplinary collaborative works. As a bassist, he has performed or collaborated with a wide variety of creative personalities that include world class conductors, composers, soloists, and producers such as Sir Simon Rattle, Matthias Pintscher, Renée Fleming, Anne-Sophie Mutter, Todd Machover, The MIT Media Lab, Grammy winning hip-hop producer Derrick Braxton, and Glenn Kotche of Wilco. Emilio has also been invited to appear at major festivals including the Stavanger Kammermusikk Festival (Norway), The Lucerne Festival (Switzerland), and The International Society of Bassists biennial conference. As a producer, Emilio releases hip-hop and dance inspired electronic music under the playfully irreverent moniker, Hot Wobble. Gene Coleman, American Composers Forum-Philadelphia Chapter - Gene Coleman is a composer and director. He is a 2014 Guggenheim Fellow and received the 2013 Berlin Prize in Music Composition from The American Academy in Berlin. Since 2001 his work has focused on global culture and music's relationship with science, new media and architecture. He was the William Penn Foundation Affiliated Fellow at the American Academy in Rome (2011) and composer in residence at Shofuso House (Philadelphia 2009), Westwerk (Hamburg, 2007), Taipei University of the Arts (Taiwan, 2007), Irtijal Festival (Beirut, 2005), Haus der Kulturen der Welt (Berlin, 2003-2004), Takefu Music Festival (Japan, 2002) and in Tokyo (2001 Japan-US Fellowship). In 2016 he became Director of the American Composers Forum Philadelphia Chapter and is co-artistic director of the 2019 Railpark Festival. He is currently composing for the JACK Quartet - a commission from the Fromm Foundation at Harvard University. Anna Weesner, University of Pennsylvania Department of Music - Winner of the 2018 Virgil Thomson Award from the American Academy of Arts and Letters, Anna Weesner is also the recipient of a 2009 Guggenheim Fellowship, a 2008 ‘Academy Award’ from the American Academy of Arts and Letters, and a 2003 Pew Fellowship in the Arts. Recent performances of her work include Cygnus Ensemble’s collaboration with Tony Arnold in My Mother in Love at Symphony Space in New York, the Daedalus Quartet’s performance of The Space Between at Chamber Music Society of Lincoln Center in November of 2017 and the Riverside Symphony’s performance of Still Things Moves in Alice Tully Hall in the fall of 2016. She has been in residence at the MacDowell Colony, the Wellesley Composers Conference, the Seal Bay Festival, the Virginia Center for the Creative Arts and at Fondation Royaumont in France. She has been Composer-in-Residence at Weekend of Chamber Music where five of her pieces of chamber music were performed (2016). Her music has been recorded on CRI and Albany Records. 2018-19 includes the Salt Lake City premiere of a new clarinet quintet called The Eight Lost Songs of Orlando Underground for the Lark Quartet with Romie de Guise Langlois, as well as a new work for Mimi Stillman and Dolce Suono. Weesner’s music has been described as “animated and full of surprising turns,” as “a haunting conspiracy” and cited as demonstrating “an ability to make complex textures out of simple devices.” She lives in Philadelphia, where she is the Weiss Professor of Music at the University of Pennsylvania. The participation of SoundLAB in the Barnes/Stokowski Festival has been made possible through the New Music Fund, a program of FACE Foundation, with generous funding from the Cultural Services of the French Embassy in the United States, the Florence Gould Foundation, Fondation CHANEL, the French Ministry of Culture, the Institut Français-Paris, and SACEM (Société des Auteurs, Compositeurs, et Editeurs de Musique). Additional support is generously provided by the University of Pennsylvania Music Department’s Contemporary Music Series and the American Composers Forum Philadelphia Chapter. We would like to give special thanks to Flute Pro Shop, Night Vision Rentals and Christopher Andrew Studios, PCMS, Downingtown Area School District, Alexander Bancer, the American Philosophical Society, Free Library of Philadelphia, Philadelphia Episcopal Cathedral, and the University of Pennsylvania Department of Music.